I can't believe it has already been a couple weeks since Eric Taylor was here teaching two great basket classes. 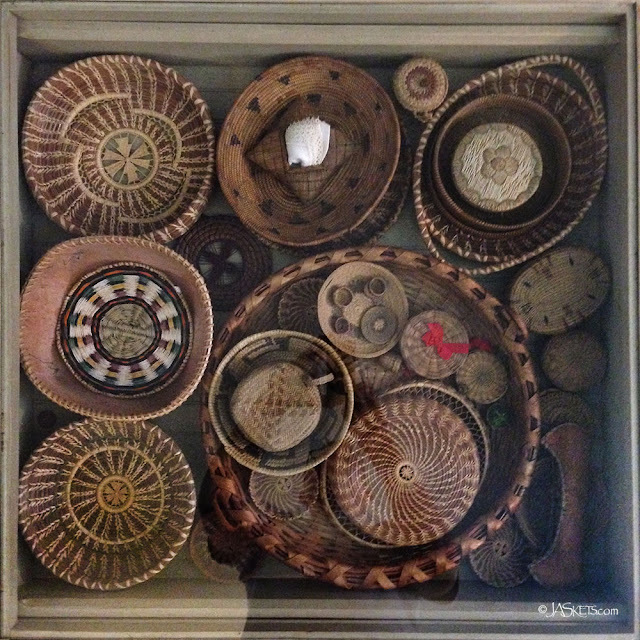 It was a whirlwind visit, but many beautiful baskets were made and we ate some delicious food. Unfortunately I was so busy working on my own baskets that I really didn't get all that many photos taken. Of course I don't know why that even matters since I am three years behind getting workshop photos posted to my website, JASkets.com. 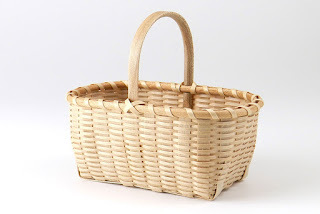 I really need to drop some of my commitments so I can actually relax and maybe (call me crazy) weave some baskets more than three times a year. Seriously I only get to weave anymore the week I go to John C. Campbell Folk School and during the two workshops I host at my house. I do weave when I vend at the one or two basketweaving conventions (Stateline Friends Weaving Retreat and the Missouri Basketweavers Guild Convention), but I don't count them as I rarely actually finish the baskets I am demoing on my weaving stands. 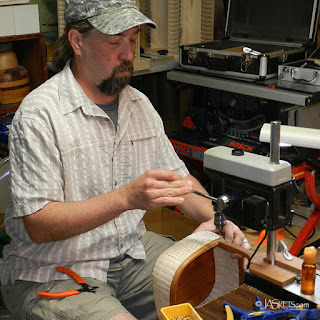 Anyway, I thought I would share a couple photos from the workshop. Here's my completed Smith River Creel. This basket was really a lot of fun to weave. 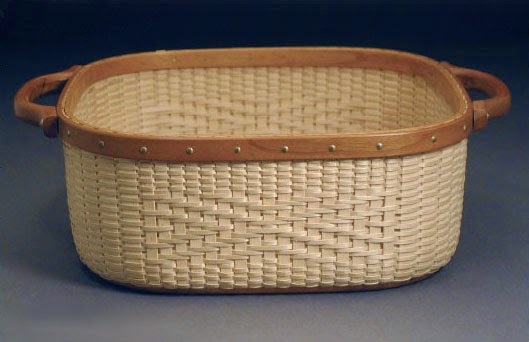 I rarely ever weave without a mold anymore, so shaping this basket by hand made me nervous, but I think it turned out really well. 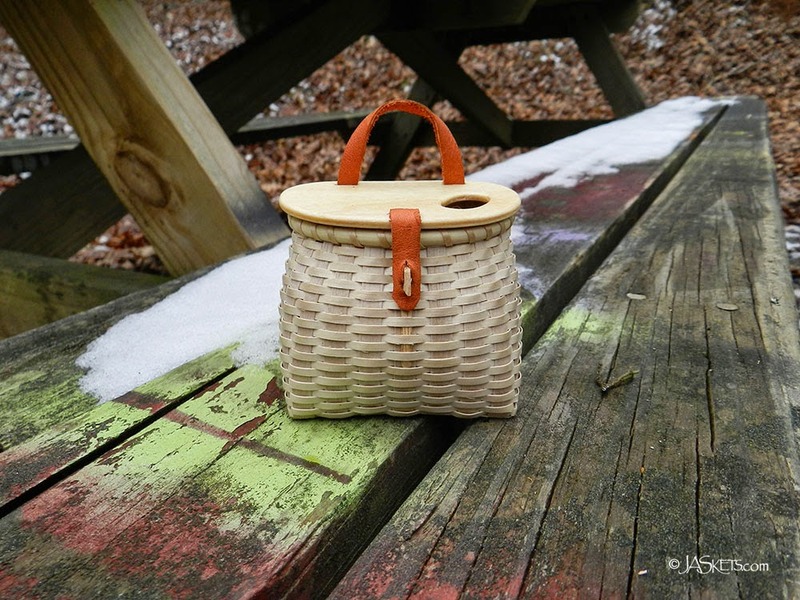 I had heard horror stories about weaving the lid, but I actually found it to be a fun challenge. Of course most would call me a glutton for punishment. This is my completed Mountain Bread Basket. 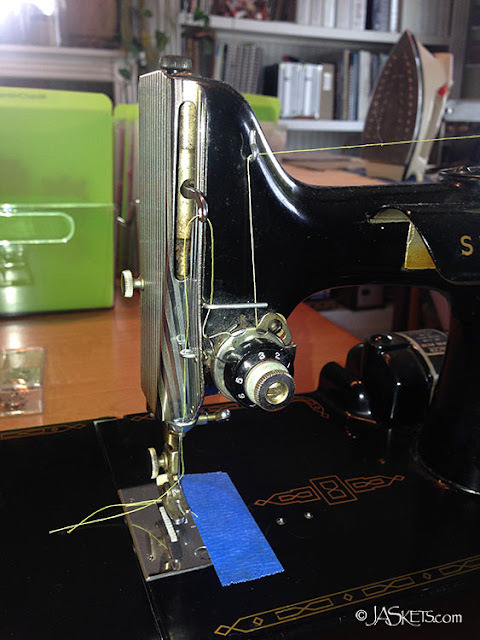 It has a really interesting twill pattern on the two sides, which was also deceptively challenging. This basket, like all of Eric's is chase woven (so woven with two weavers), and I happened to have a light and and a dark weaver. So, my pattern alternates each row light/dark which makes it hard to see. Fortunately in a few years (or quicker if I put it in direct sunlight) the colors will darken and the difference will not be noticeable. I did catch a few photos of Eric at work. Here he is putting the first four rim pins in for one of the participants. That way he makes sure the rims are nice and level before all of the other pins are inserted. And finally, the class wouldn't be complete without a trip to Ted Drewes for a Concrete. On the last night Tina and I actually just skipped dinner all together and went back for a second one. Sorry I don't have more photos to share, but you can see some more on my Facebook page if you like. Eric Taylor will be back in St. Louis again this May to teach two great classes. 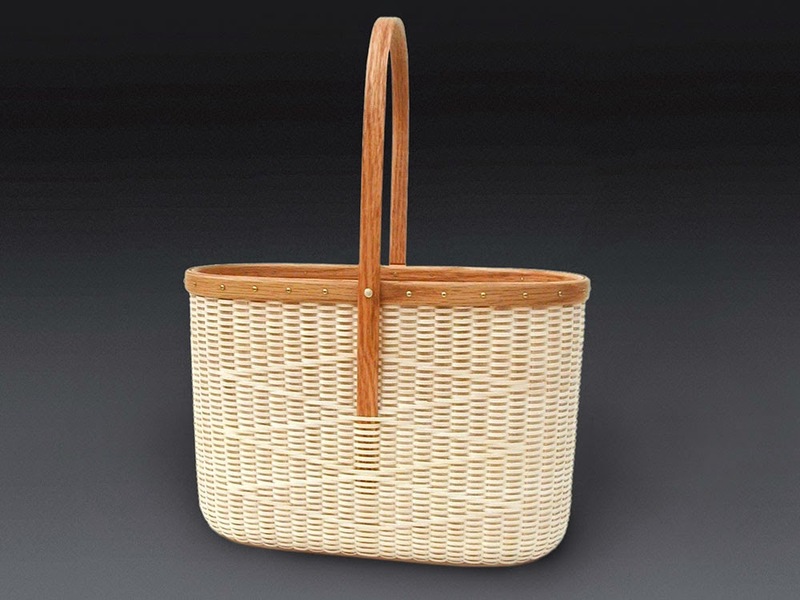 Eric Taylor has been making traditional baskets and Shaker boxes since 1983. 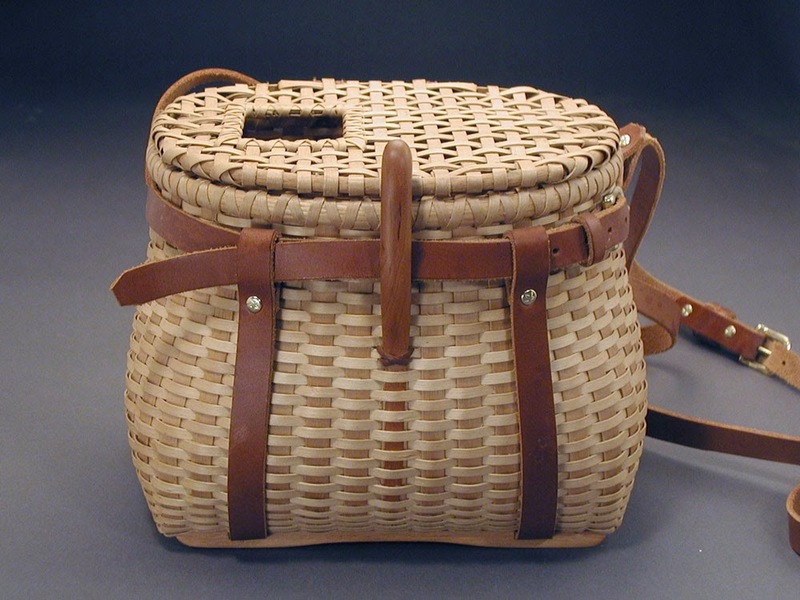 His love for working with wood and the black ash trees inspired him to experiment further in the art which lead to creating his own contemporary designs that combined the elements of the Shaker and Nantucket baskets. Eric has taught the art of basketry, nationally, for over twenty years. 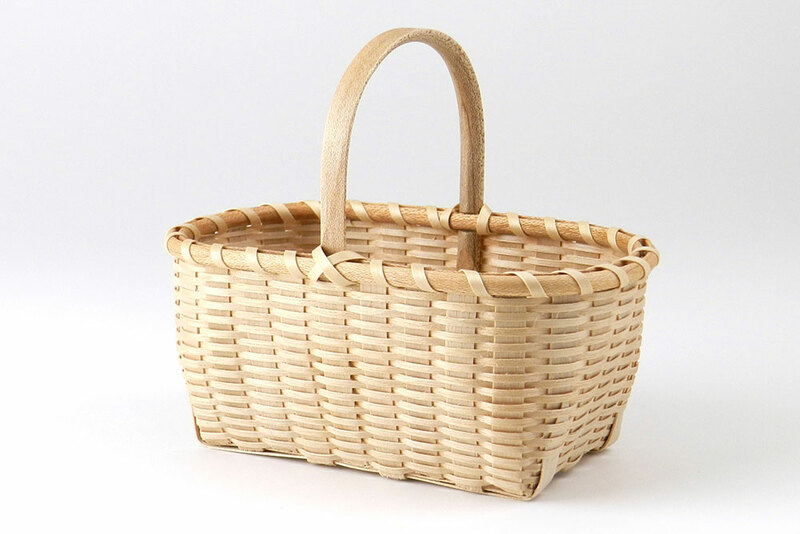 Woven of brown ash, this distinctive basket features a decorative repeating twilled diamond pattern, and cherry handle, rims and base. On a personal note, this is the first basket I ever wove with Eric. You don’t have to fly fish to love the Smith River Creel. 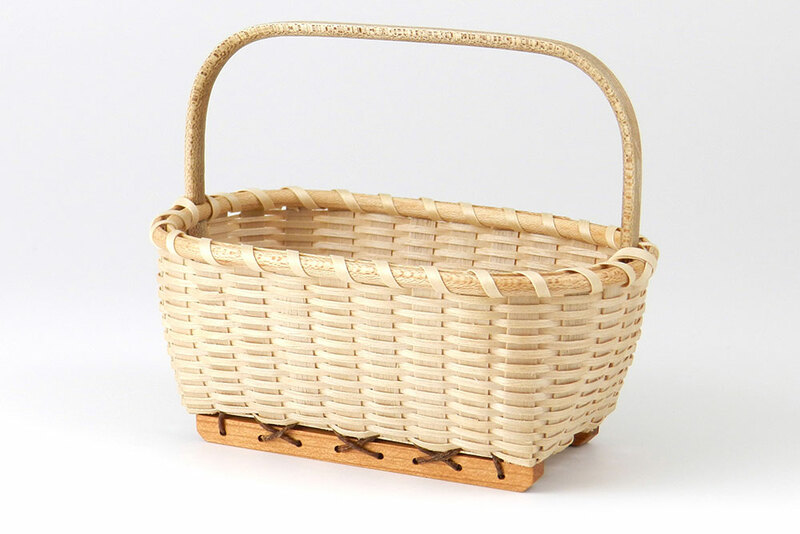 This functional, yet decorative, basket is woven of brown ash with cherry runners and latch, and features adjustable leather straps. 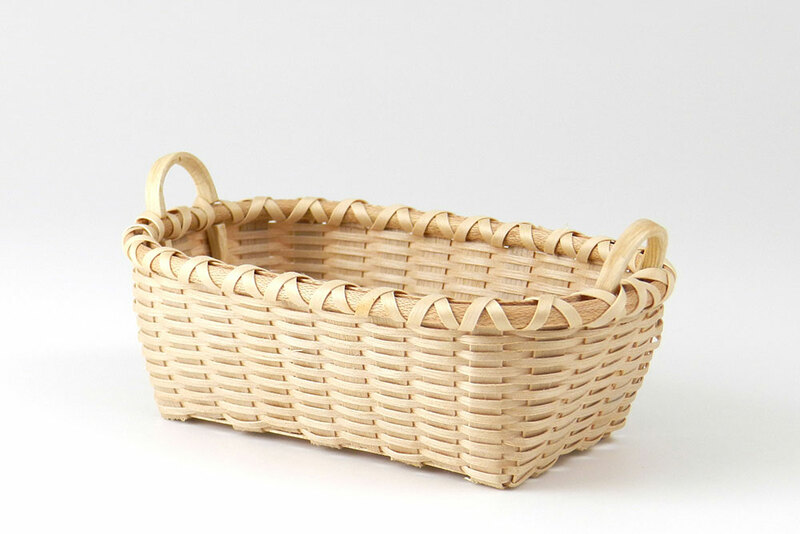 Woven of brown ash this multi-functional basket features an intricate twill pattern, and cherry side-handles, rims and base. 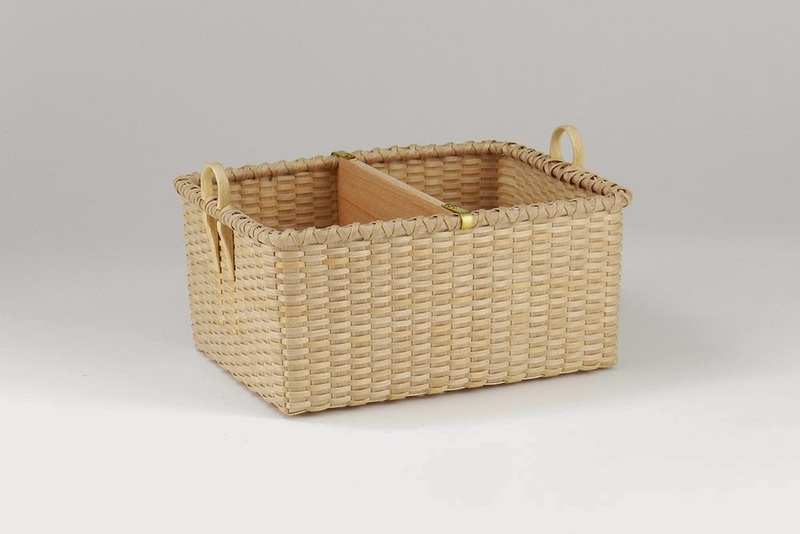 Add a cloth napkin and a warming stone, and you have a great basket to serve rolls to your guests. 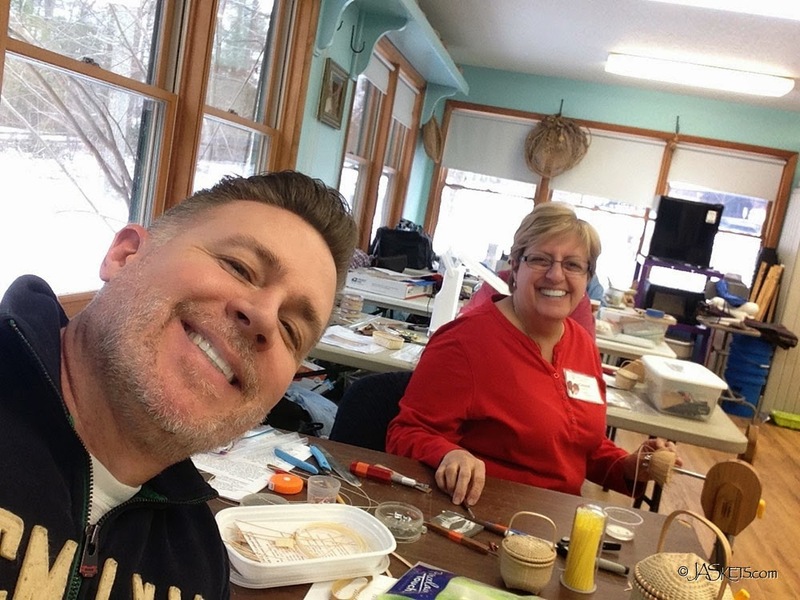 So another wonderful week at the John C. Campbell Folk School and my class with JoAnn Kelly Catsos has come and gone. I just hate how fast the fun times have to fly by. This trip though I added on an extra day at the start and end, which made for two nice bonus days. 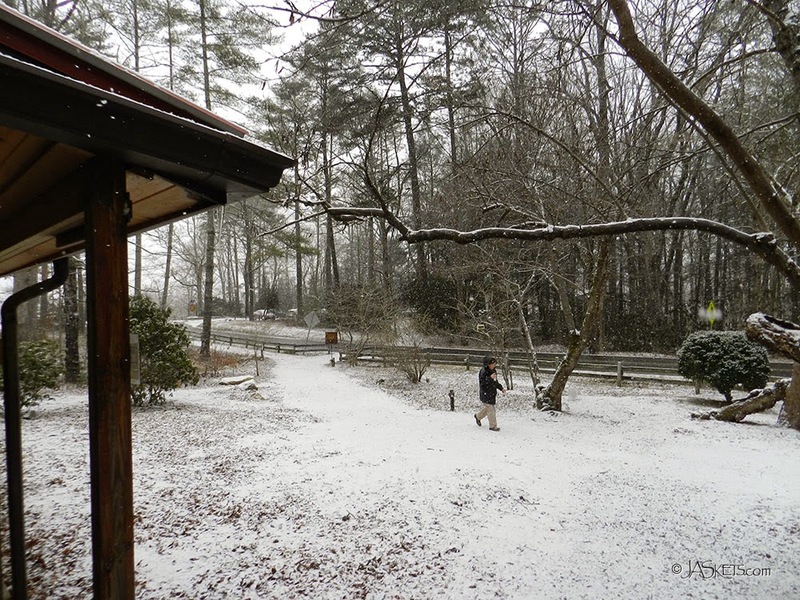 The weather was a bit dicey this time too, so the extra day at the end helped miss driving home in the snow. 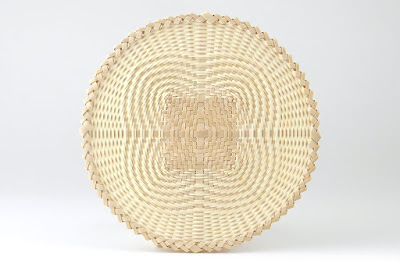 Even with the iffy weather many beautiful baskets woven. We just didn't take any extra time walking to and from the basket studio and the dining hall. My Mom asked for a monopod for Christmas so she could take sunset photos on the beach, but I accidentally got her a selfie-stick instead. 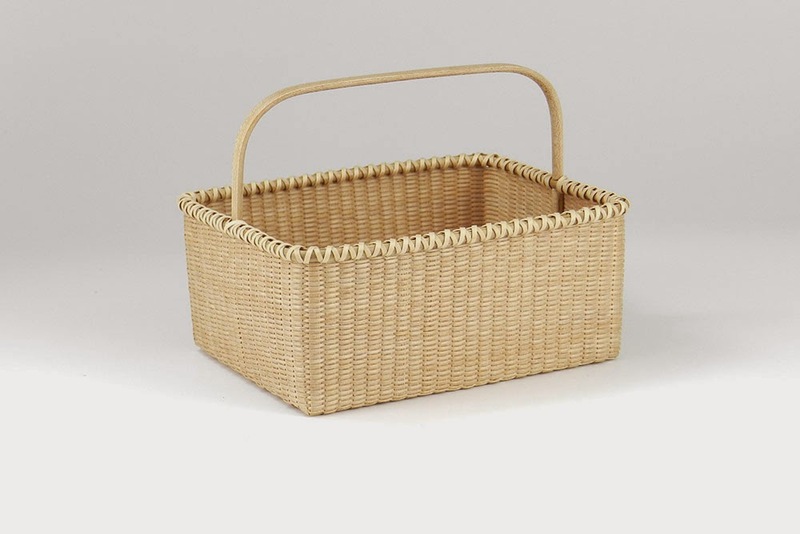 So, my mistake was my gain and my torment to my fellow basket weavers. 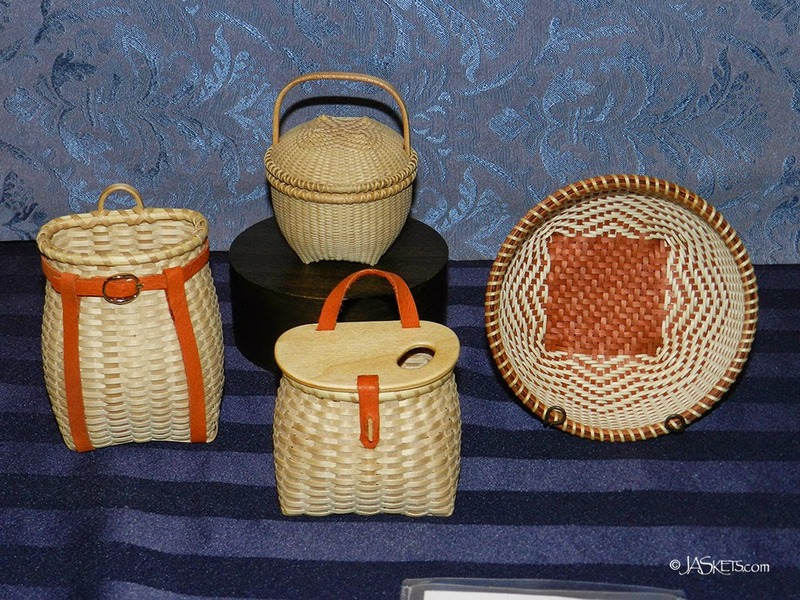 I wove four intricate miniature baskets and finished up a few others that I brought with me that needed to have their rims lashed. Every year I give my Dad a basket for Christmas, so this past Christmas I had planned on giving him a Birkshire Backpack. I had made one a few years ago when JoAnn Kelly Catsos and planned on making on making a second one for him. Of course I didn't get the second one done, so I had to give him mine. I finally had time to reweave it. 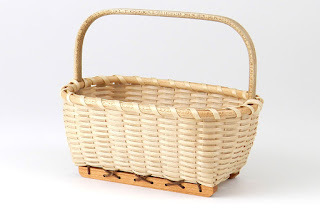 JoAnn's baskets are so perfectly proportioned that in photos it is hard to tell how big they are. 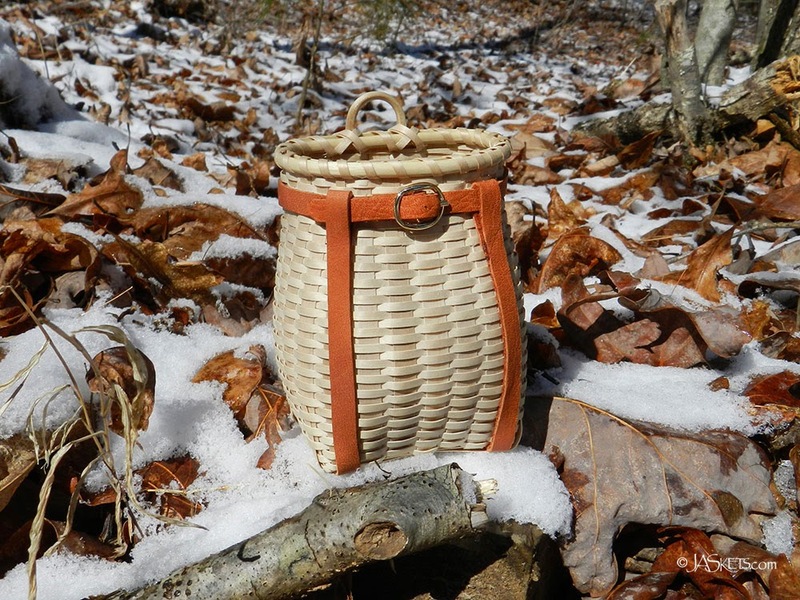 This shot of the business card sized basket in the snow would almost make you think it was a full-sized pack. 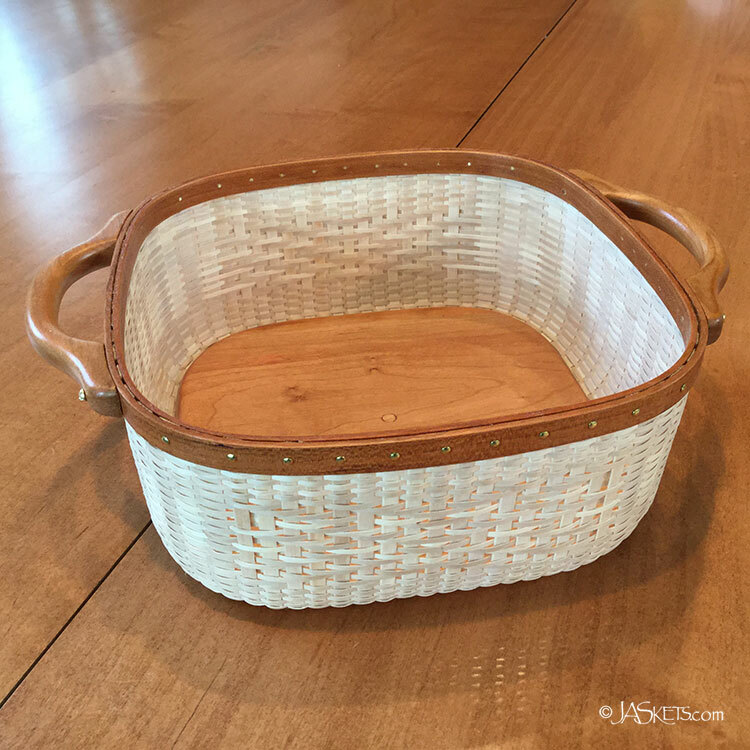 While I have woven so many of JoAnn's baskets I had never made Steve's Fishing Creel. 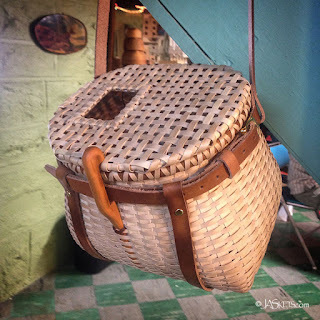 I just need to attach the tiny hand-tied fly and fleece to the basket and it will be complete. 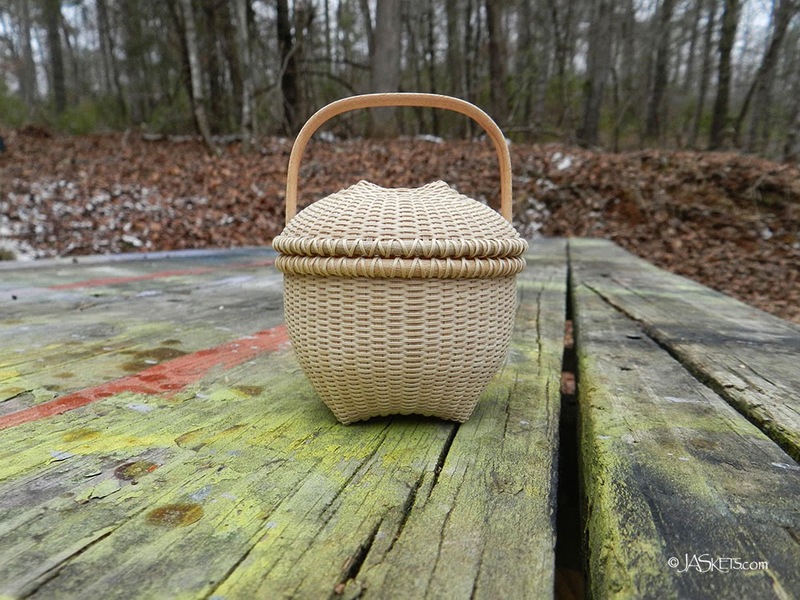 This lidded cathead has always been one of my favorite Shaker designs and one I have woven in many sizes. This 2.5" version is by far the smallest and the most challenging, but well worth the effort. This is a 4" version of JoAnn's Snowflake bowl, but with dyed stakes. I just love this pattern and love the contrast of the white weavers to the chestnut colored stakes and rims. 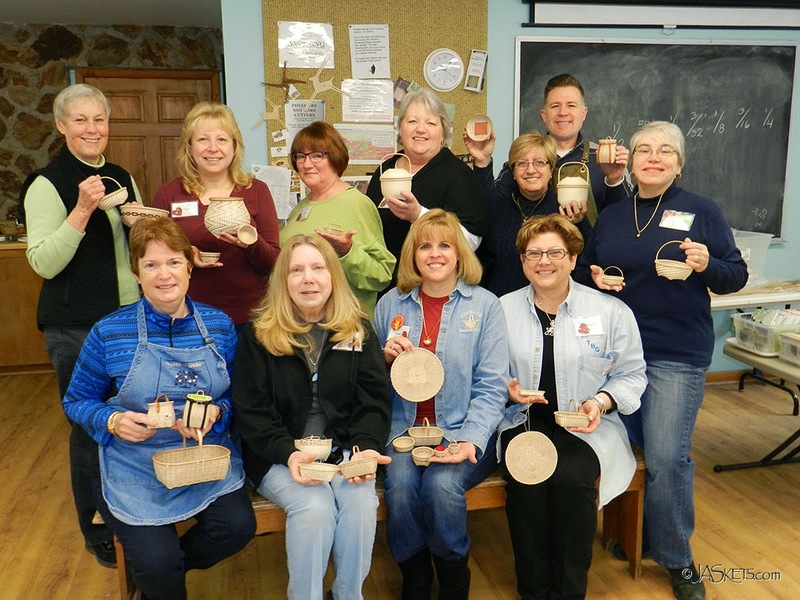 If you have been to the John C. Campbell Folk School or you have read my posts about my trips there you know that on the last day they have a "show and tell" where everyone gets to share the accomplishments from the week. 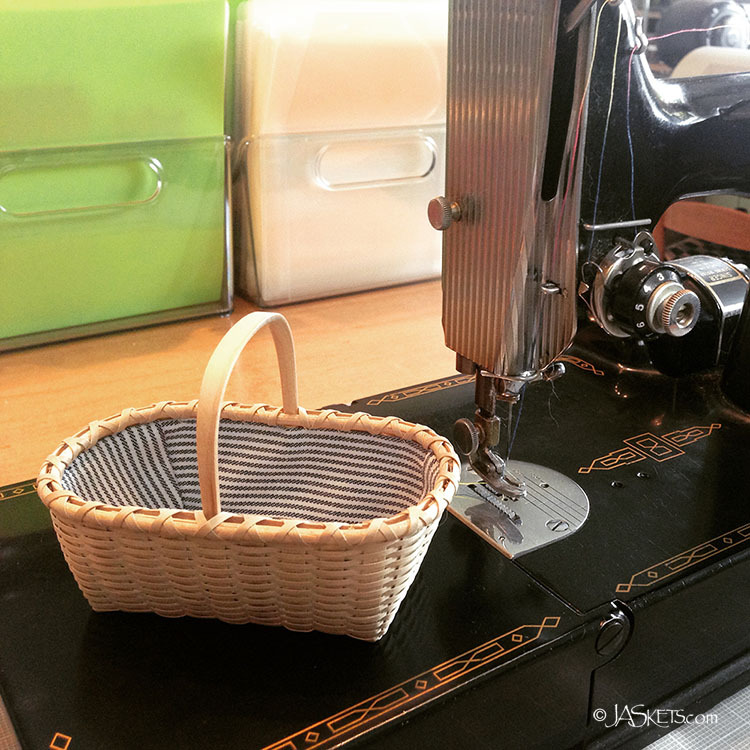 It is always so exciting to see what has been going on in the other studios (I never seem to make it out of the basketweaving studio). 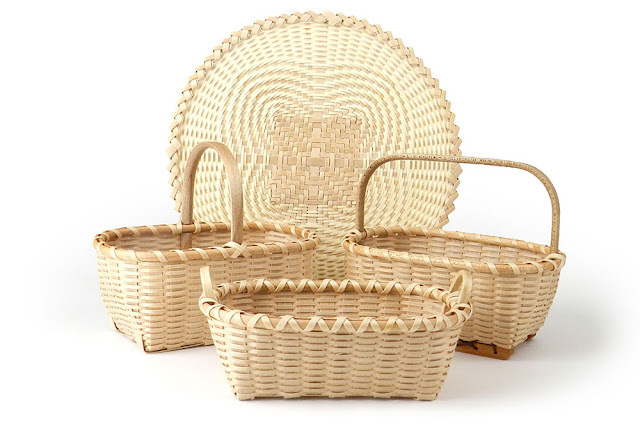 Here's a picture of my four completed baskets. And here is a picture of our happy class. The weather may have been frightful, but inside it was so delightful. Look what I just stumbled upon. I guess I took these photos last year, but because the materials are perfectly scaled I didn't realize when I saw them that they weren't old photos of my full-size versions. 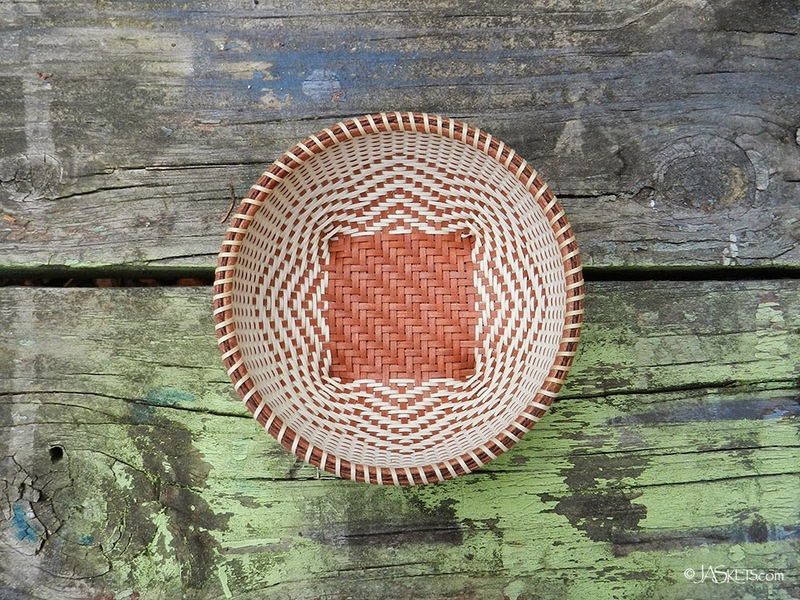 Both baskets were made on the same 3"x4" mold in 2014 at the John C. Campbell Folk School. 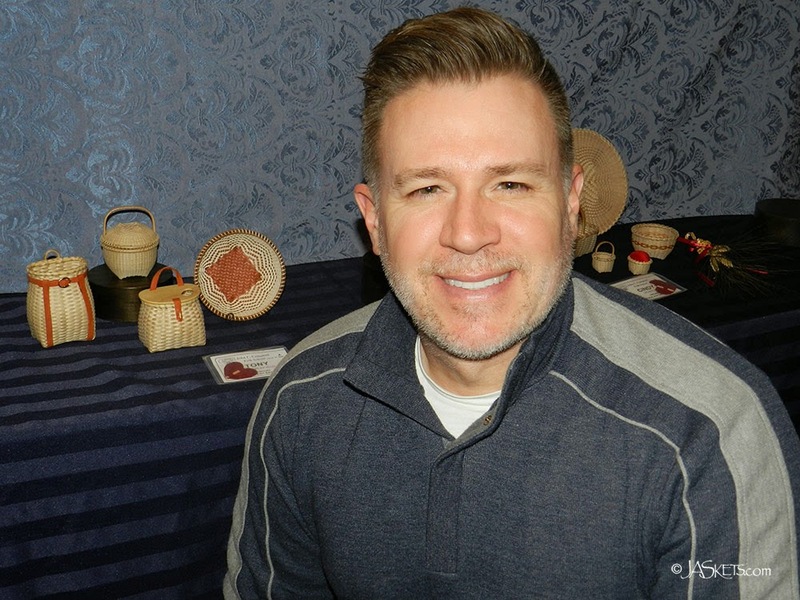 So have you heard that metrosexual is out and lumbersexual is in? Well it is. I actually just learned this myself the other day. So no more skinny jeans and smartly tailored shirts, it is all about the flannel and beards. While my facial hair is way too white these days to sport a beard longer than the 1/8th inch setting on my trimmer and I don't have any flannel (though I do like a good plaid shirt), I did decide to use a rustic cabin theme to my Christmas thank you cards. 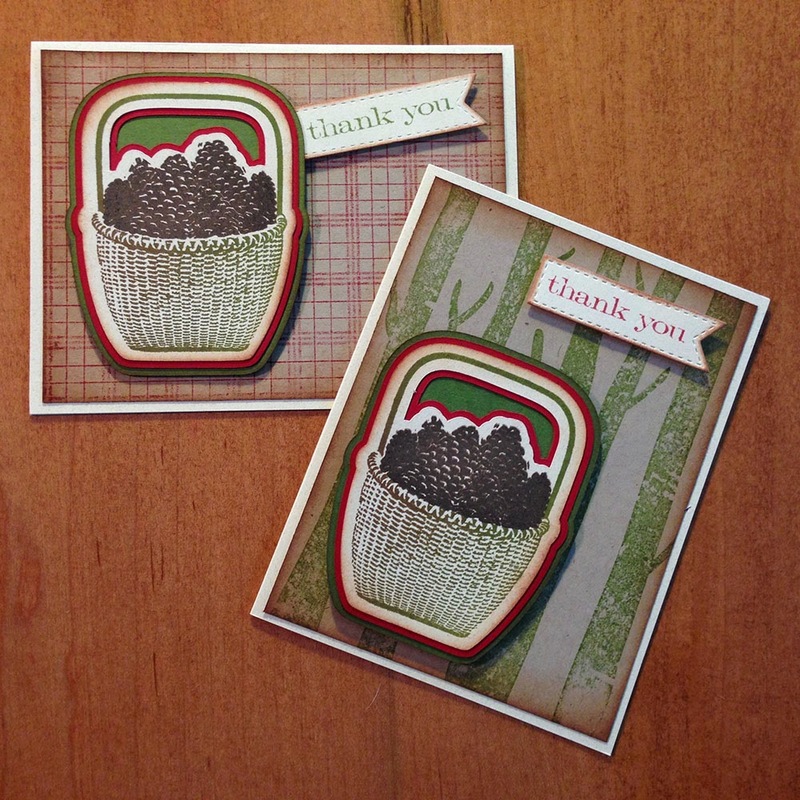 I used a set of two-part basket stamps that I made awhile back. These may be one of my 2015 releases, but I haven't decided yet. I need to get busy with that though as I usually introduce my new stamp sets in April at the State Line Friends basket retreat. 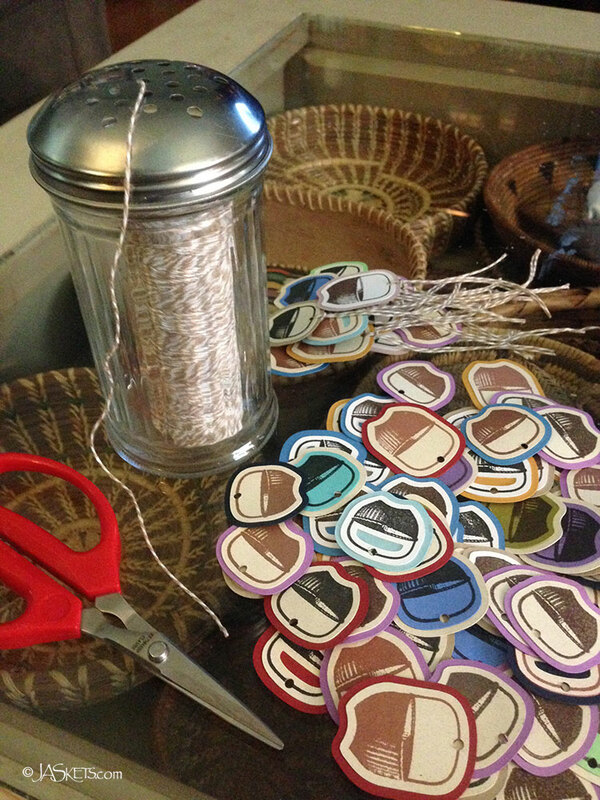 I also used my Sizzix Eclips to cut out the layer frames. I kind of wish I had cut out the inside of the back most green layer even though it would have only been a small hole. The thank you stitched banner/flag was die-cut using a Lil' Inker Design framelet and stamped with Tim Holtz' Simple Sayings. 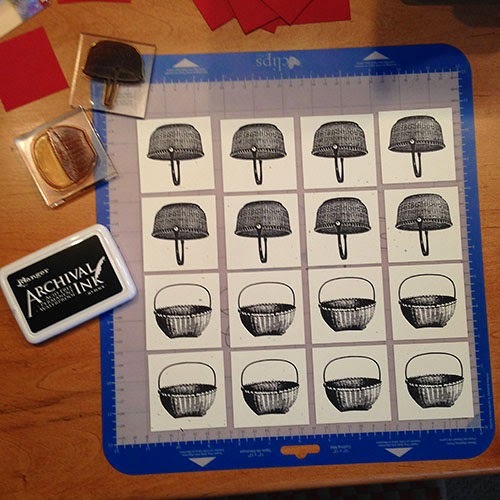 The two background stamps are ones I think I picked up at Michael's. I used a combination of Ranger Distress and Adirondack Ink, with the pad I used for the basket was one I made myself using two colors of Distress Ink refillers. While the red and green color combination would typically be very Chirstmas-y, I think with this design it just looks like a warm and cozy winter by the fireplace. 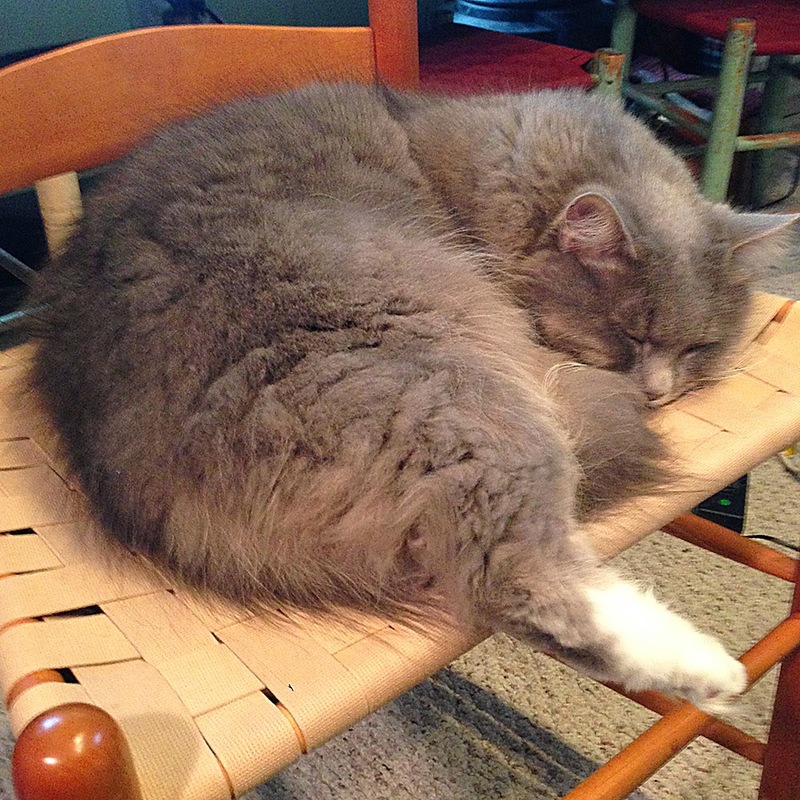 My supervisor is either bored with me or my flurry of crafting has pooped him out. I have actually had a small burst of creative energy which fortunately corresponded to some free time. Typically as I walk to my car after work I have all these ideas and creative excitement running through my head, but by the time I have walked into my house my only thought is about dinner and sitting on the couch, and then the next thing I know it is time for bed. This holiday season we were given two extra days off, so had a nice long break between Christmas and New Years. While this seemed like the longest time in the world it flew by so fast it made my head spin. Fortunately on the Friday after the first of the year I spent the day in my craft room paper crafting up a storm. My supervisor keeping watch over my output. Today's project, working on restocking my embellished journals. I love the big work table my Dad built for me a few years ago. 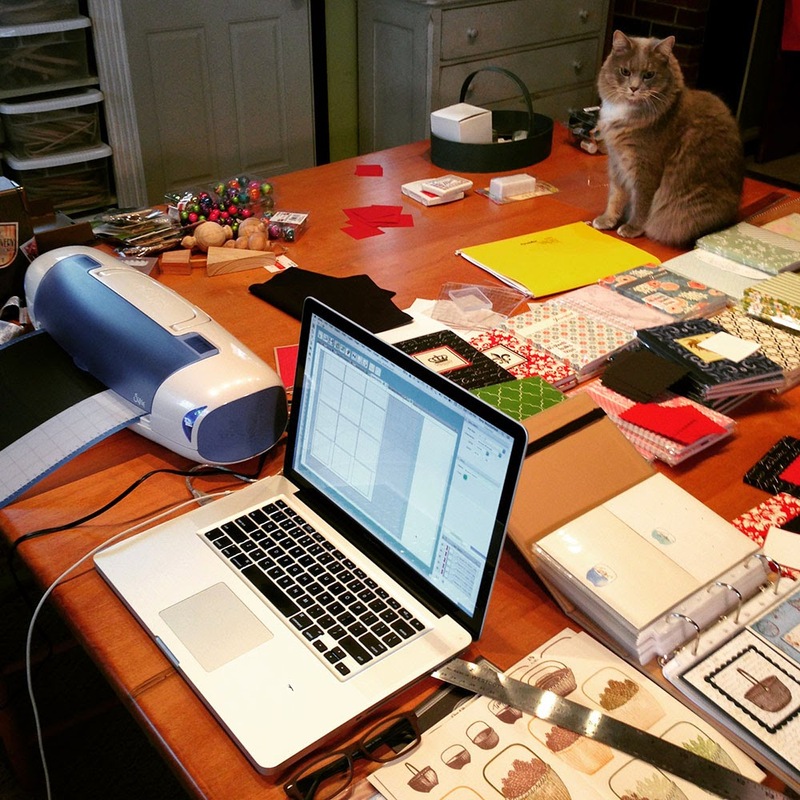 I can spread everything out and use each side of the table as a separate work station. The downside is that I can spread everything out and make a big mess which I don't always clean up in a timely fashion. I wish my helper/supervisor was better at putting stuff away, but his idea of helping is to knock things off onto the floor. A sheet of freshly cut squares from my Sizzix Eclips stamped with my custom basket stamps using Ranger Archival Ink. I love my Sizzix Eclips cutting machine. These aren't very exciting shapes, but they are perfectly sized to layer on larger squares and/or scalloped boards that I also cut. 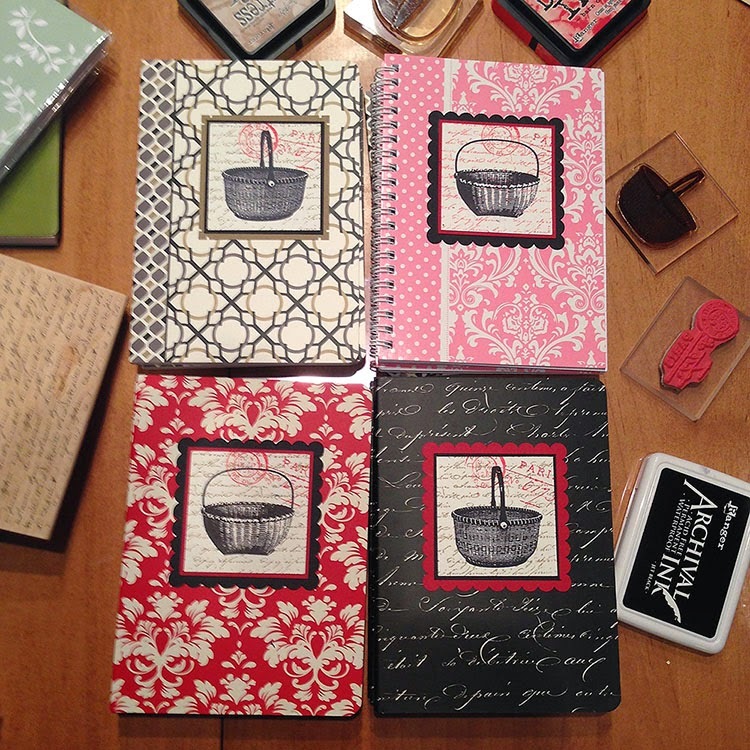 Journals embellished using my line of custom basket stamps that I produce and sell. I was kind of stuck on a theme, but when you are embellishing a dozen journal covers it is much more efficient to come up with a design and repeat it a bunch of times. 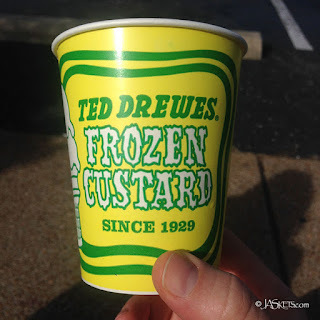 I sell these guys when I vend at basket conventions. I take spells of selling these and I had let my stock get really low, so this set will help replenish my stash. Hope everyone is having a crafty and productive 2015 so far.